The activation dynamics of nuclear factor (NF)-κB have been shown to affect downstream gene expression. On activation, NF-κB shuttles back and forth across the nuclear envelope. Many dynamic features of this shuttling have been characterized, and most features vary significantly with respect to ligand type and concentration. 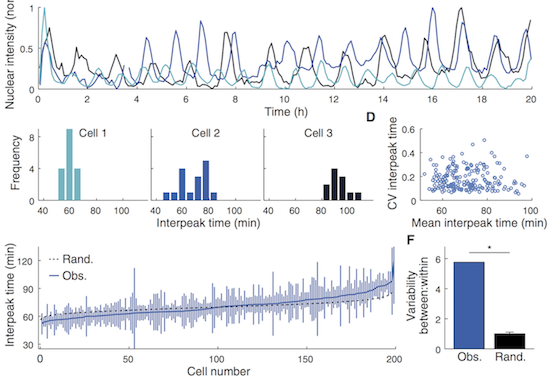 Here, we report an invariant feature with regard to NF-κB dynamics in cellular populations: the distribution–the average, as well as the variance–of the time between two nuclear entries (the period). We find that this period is conserved, regardless of concentration and across several different ligands. Intriguingly, the distributions observed at the population level are not observed in individual cells over 20-h time courses. Instead, the average period of NF-κB nuclear translocation varies considerably among single cells, and the variance is much smaller within a cell than that of the population. Finally, analysis of daughter-cell pairs and isogenic populations indicates that the dynamics of the NF-κB response is heritable but diverges over multiple divisions, on the time scale of weeks to months. These observations are contrary to the existing theory of NF-κB dynamics and suggest an additional level of control that regulates the overall distribution of translocation timing at the population level.